The Little Magpie: Who's bad? Helllo! Today's post is one of my favourite outfits in a while, but you'll have to excuse my tired face - these were taken at the end of our trip to Vienna and I was running on very little sleep. And possibly a lot of gluwein. The entire outfit's from Zalando, you know how much I love 'um, and features what I would possibly say is the best jumper ever. Kidding, that's too serious a claim and I couldn't possibly be sure, but it's definitely up there. It's nice and cosy, has a slogan (which I love) and cropped sleeves (which I love even more). I popped it on over this Missguided lace dress to make it more of a daytime look - that could, however, be easily transformed into a nighttime look if the occasion arose - and then finished it off with my t-bird jacket. God I want to be in Grease. Anyway, I'm off to London this morning and in classic Amy style I'm only about 90% packed. I'm off to see Jersey Boys - which I'm mucho excited about - and I imagine a lot of food will be involved too. New year... old me. Oh, also, I'm off to New York next week for the first time EVER next week which I'm ridiculously excited about. If any of you have any recommendations on things I need to see or do - or even some last minute ones for London this weekend - then please do let me know! I'll give you some of my leftover Christmas chocolate as a thank you. Last thing, god go away, I know, I popped up a little lookbook with four party looks. and I did promise I'd share it with you on here, didn't I? So here we go. Videos just make me very nervous and when I'm nervous I apparently do lots of bad dancing.. I'm genuinely sorry in advance. I just wanted to say I freaking LOVE your moves in the video! :D So good. Amazing outfit too. 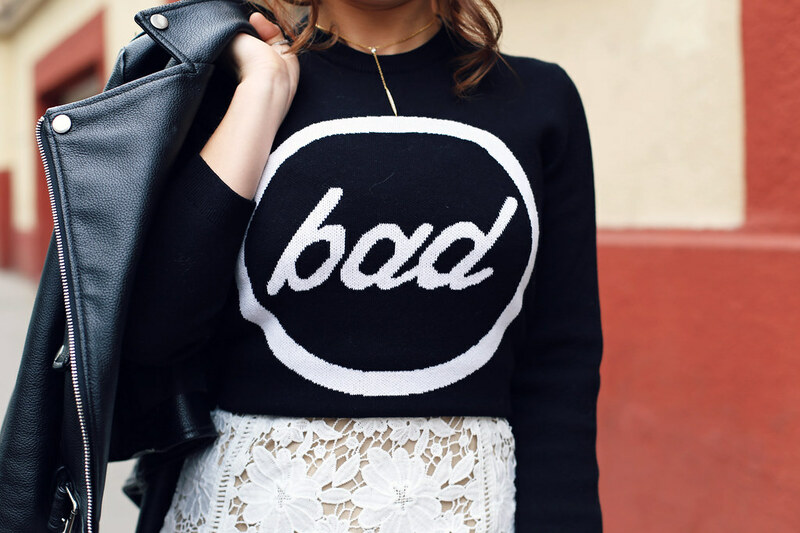 Love how you styled the dress with the sweater!! SO cute! I love the mix of feminine and edgy pieces together! Tips for NYC - Century 21 near Ground Zero (like TK Maxx but incredz) & if you're short of time, I probably wouldn't bother with a trip to the Statue of Liberty... She's so small and can be snapped from the Staten Island ferry! The lace with the leather.. ohhh yes!